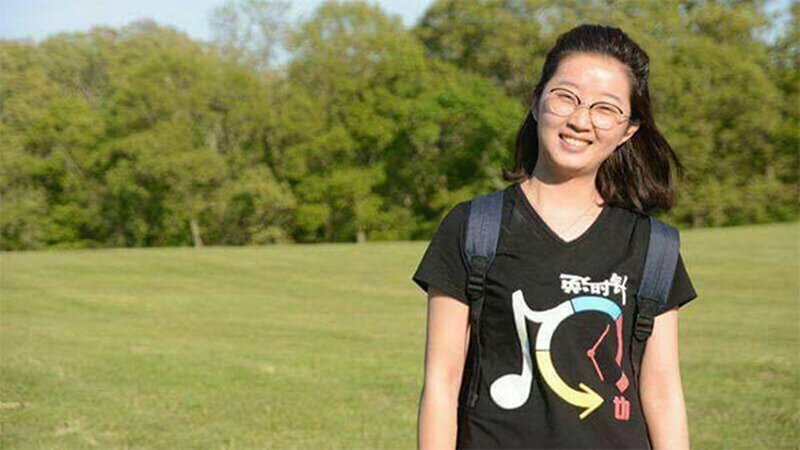 URBANA, Ill. (WLS) -- University of Illinois Campus police are asking the public's help locating visiting scholar Yingying Zhang, 26, who is missing from the U of I Urbana-Champaign campus. Police said Zhang has not been heard from since Friday afternoon, and attempts to reach her by phone and at her residence have been unsuccessful. Police said Zhang boarded an MTD Teal Line bus at 1:35 p.m. Friday, June 9, at Orchard Downs. She left the bus at Springfield and Matthews avenues in Urbana at 1:52 p.m.
She was last seen just after 2 p.m. Friday on security video from the B-4 parking garage on North Goodwin Avenue that police released. In the footage, Zhang is seen on east side of North Goodwin when a black Saturn Astra of an unknown year pulls up beside her. She and the driver speak for a period of time before she gets in the car, which drives away heading north on Goodwin. The final clip in the video shows a closer view of the same car from a different camera, just before it picked up Zhang, police said. Police said Zhang was last seen wearing a charcoal gray hat with a white logo on the front and a white and pink flannel print long sleeved shirt, white undershirt, jeans, white shoes and a navy backpack. She has shoulder-length brown hair and wears glasses. If you have any information about Zhang's whereabouts call 911 or the University of Illinois Police at 217-333-1216.